The creeping flow of polymer solutions in porous media is a problem of fundamental importance and has many applications in engineering. Understanding such flows has proven a considerable challenge. Part of the challenge is to understand the coupling between the nonlinearities of non-Newtonian fluids and the multiscale nature of porous media. This takes us away from the paradigm of linear flows and Darcy’s law. 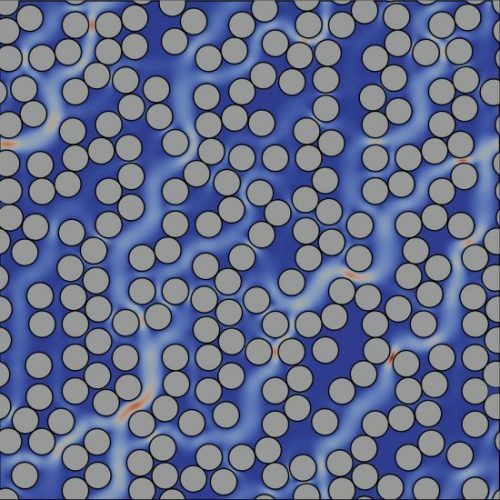 To learn more about this problem, our strategy is to develop high-performance CFD tools that allow us to simulate large volumes of porous media and to understand the links between flow at the different scales of the system. Using this approach, we have recently looked at the pore-scale and Darcy-scale physics of shear-thinning fluids in porous media and at the impact of slip boundary conditions on Darcy-scale flows. 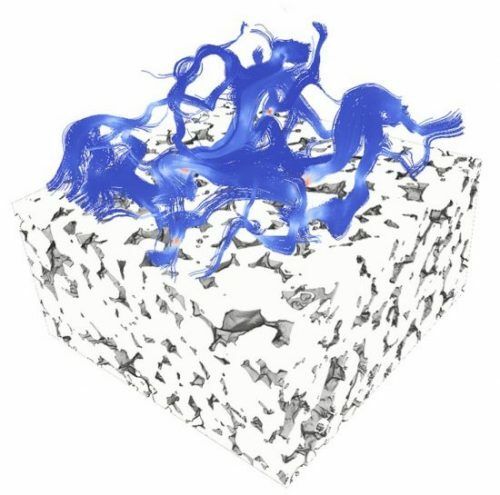 We are now focusing on the connections between the apparent permeability of the system and viscoelastic effects associated with changes in the conformation of polymer chains and their interactions with the porous structure. Such phenomena may lead to an apparent thickening effect at Darcy’s scale, even for solutions that are shear-thinning in a shear rheometer. 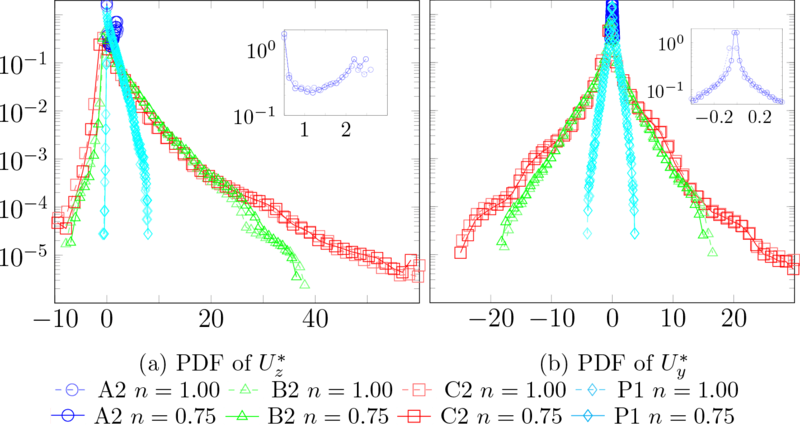 Recent experimental and numerical works suggest that this may stem from instabilities at the pore scale and elastic turbulence effects that can develop even at low Reynolds numbers. We are trying to understand this! Probability density functions of longitudinal and transverse velocity fields in various porous structures.